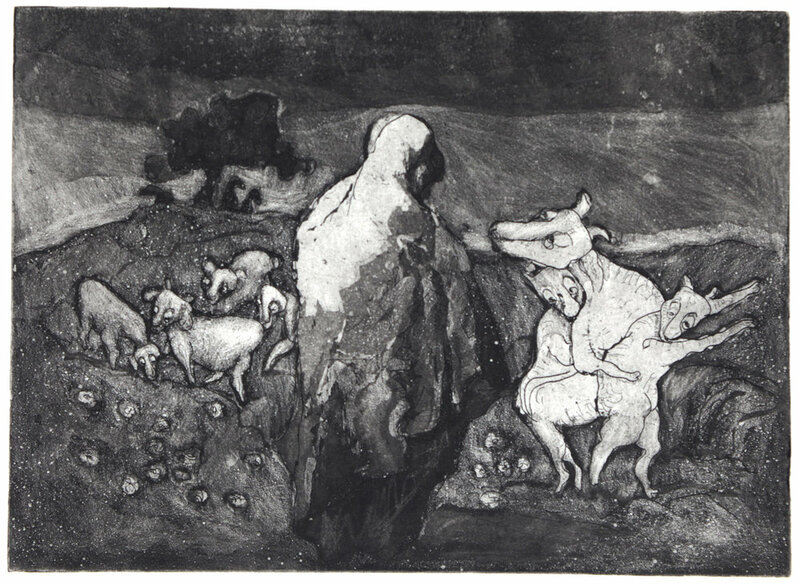 The series “Scapegoat” derives from the Biblical text and from Mishnaic texts. Beit HaMikdash (sacred Temple), in which a scapegoat was used as a vessel upon which to foist the people's sins. Led off into the desert by a "fit man," far away and out of sight, the scapegoat was ultimately sacrificed, cast off a cliff to meet its death and dismemberment. And the fit man? He will die before next Yom Kippur comes. In my work, I raise the scapegoat and the “fit man” from their thankless ritual anonymity and place them center stage, where we can consider their unfolding relationship and empathize with their shared fate. The imagery was inspired by Goya’s Los Caprichos etching series, whose scenes depict social injustices.